Detective Johnny Block slowly scratched the crumpled collar of his three day old shirt. Yet another strange case had got him stumped. A series of disappearing Mercedes-Benz owners and their cars. Johnny had of course checked out the only car dealership for miles around – Crystal Peak was a small town after all. The proprietor, old Dave Diamond, seemed a harmless Geezer. His two sons were surely cut from the same cloth, albeit a little rougher around the edges. Detective Block paid them a little retainer, so they’d keep their ears to the ground. So far, he had got nothing to show for it – other than a healthy discount on a C-Class Coupe. How could the perp keep getting clean away with it? As he waited behind the wheel for the Diamond’s automatic car wash to kick in, Johnny looked at the thirty-something sons, David Junior and Danny valeting a nearly-new Merc. But why were they using bleach? Bleach! Wait a minute! That car’s interior would soon have any trace of the previous owner removed. Right down to the DNA. Johnny slid his gear lever to Reverse, but the automatic chain was already pulling him forward. He started to open his door but a huge spinning brush forced it shut again. He quickly closed his half-open window as the soapy bristles threw water into his face. 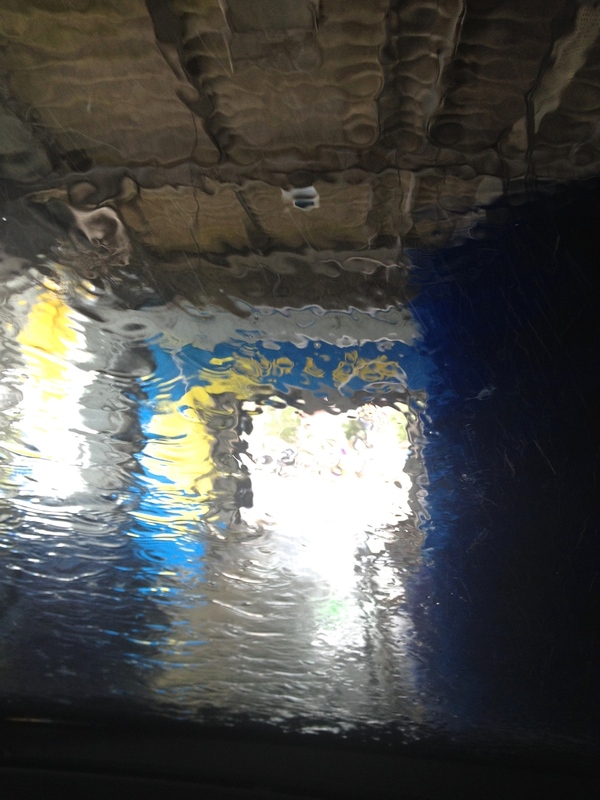 From inside the car wash, Johnny was aware of a dark figure wearing a hooded waterproof, walking up to his door. Instinctively, Johnny drew his pistol, but it slipped through his soapy fingers and under the pedals. The figure pulled at Johnny’s door handle at exactly the same time Johnny put his shoulder against the inside. The impact sent the figure reeling. Johnny leapt out of his car and picked up the metal bar that the figure had dropped. He needn’t have worried. The hooded man was out cold. Johnny, now completely soaking, thought about pressing the Emergency Stop button, but then decided against it – he had paid for the Deluxe Wash after all. He grabbed his pistol and then waited for his Merc to come to a gentle stop. And that was that. The whole family came without a struggle. They admitted to a string of unfortunate victims, and the terrible trio will all be sewing mailbags until the big check-out. On a brighter note, their business was broken up, and most members of the Department have bought a nearly-new Mercedes at a discount price. Nice! Click the blue frog to view other posts in this challenge.